Clearly, brands are complex and managing a brand is not getting easier. The basic idea of this Brand Tags site "is that a brand exists entirely in people's heads". With the site, you are shown a brand and asked to input any word that comes into your head. 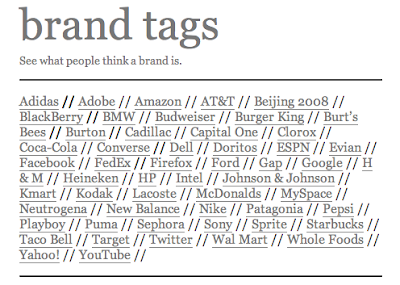 More interesting is the tag cloud of words that others have used to describe various brands.